Welcome fellow sewists! Hope this past week has been a great one. First off I want to say congratulations to all those that participated in MMM’14. 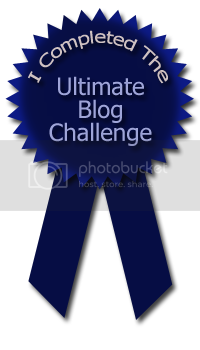 I am in awe of all those that gave that challenge a try, your outfits were wonderful and creative. Applause To All! Check out their group here! There are two new thrift stores in town and I forged through their wares on Saturday. 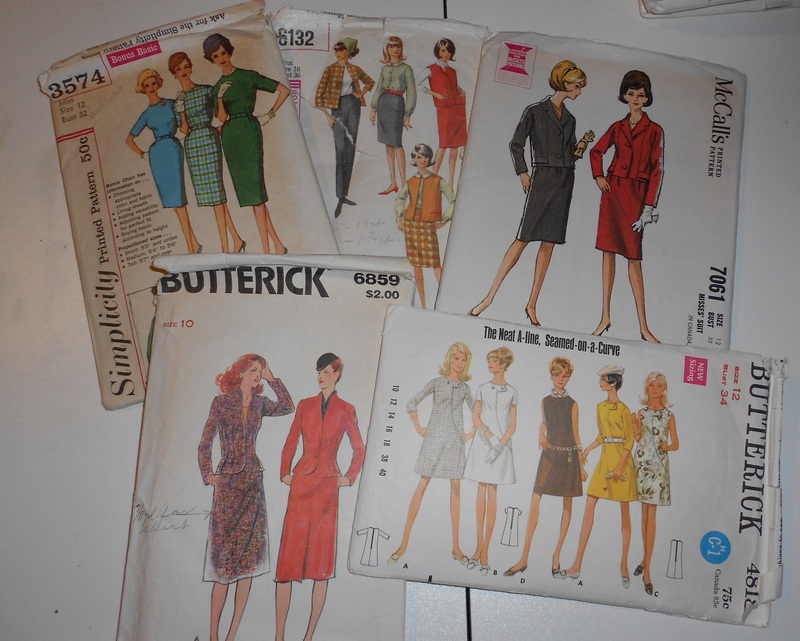 I squealed with delight when I was able to find a box of patterns in the back corner of one. 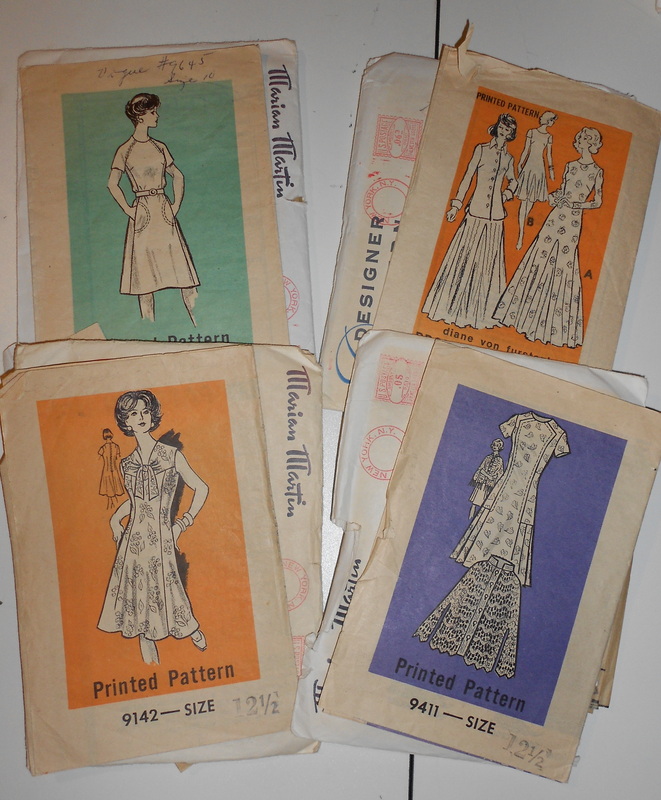 Yeah, people in the store looked around like I had discovered a Rembrandt hiding in a stack of $3 pictures but once they saw I was digging around in a dusty box of old sewing patterns they kinda rolled their eyes and went back to what they were doing. None of them are rare or spectacular but I believe any patterns that are over 50 years old should be preserved and loved. 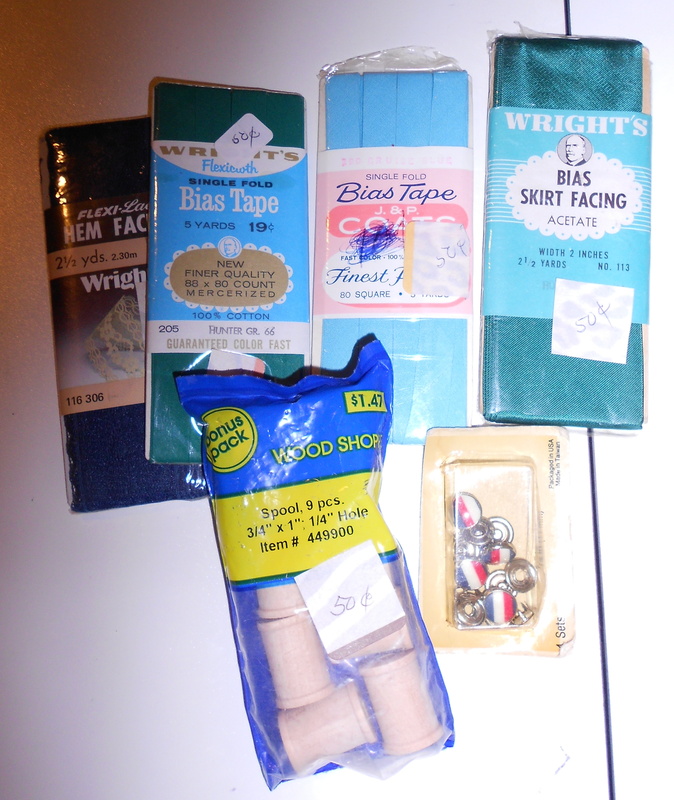 And who could resist those cute little red, white and blue snaps or those tiny little wooden spools. Plus I got them all for less than $7! The bonus is the proceeds go to our local APA (Animal Protection Association) that sponsors a No-Kill Shelter. A cash donation went into the pot as well. 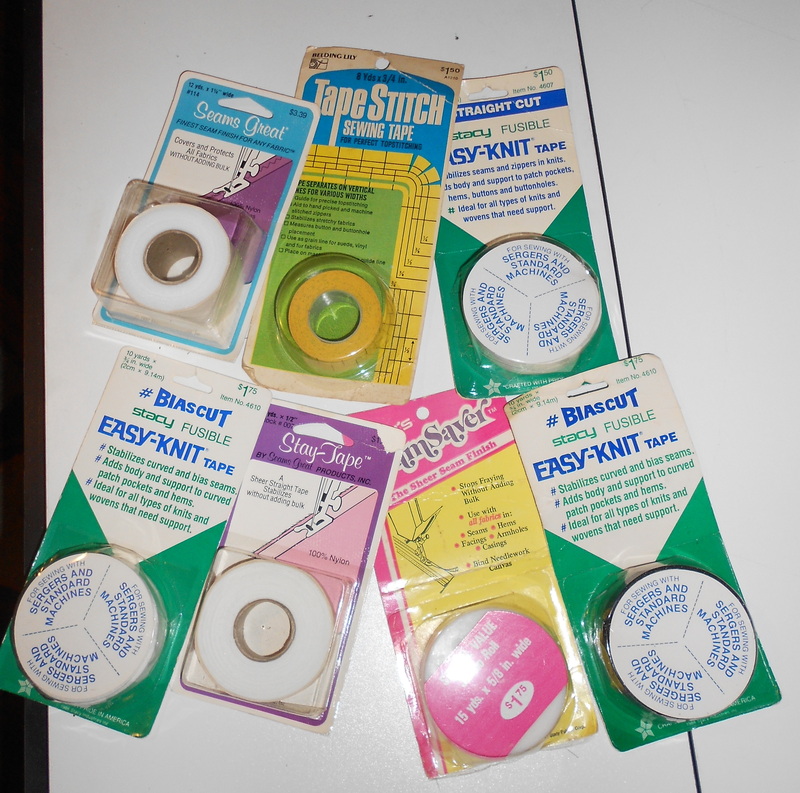 My next stop didn’t score a single pattern but I did come across a few packs of seam tape. Another great bargain and I was able to talk to the store owner about sewing patterns, only to learn that he had a huge box that he threw away last week because they were ‘too old’ and he didn’t think anyone would be interested. I ran to his dumpster but the trash man had already come and gone, the patterns now a part of the ever growing landfill. He knows what I am looking for now and he promised to never throw any of them away again. A friend brought me a box of goodies! Another great score of vintage notions. 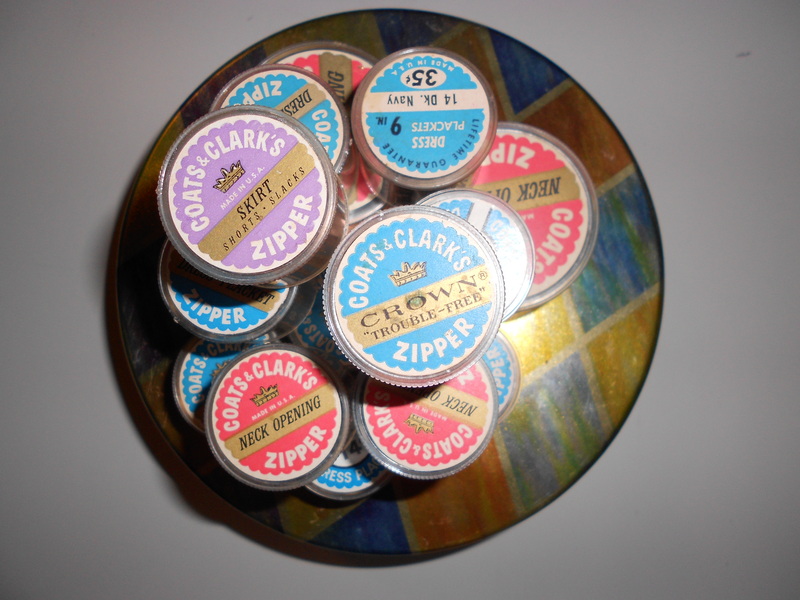 I had no idea that zippers use to come in little round plastic containers! They are so wonderful. 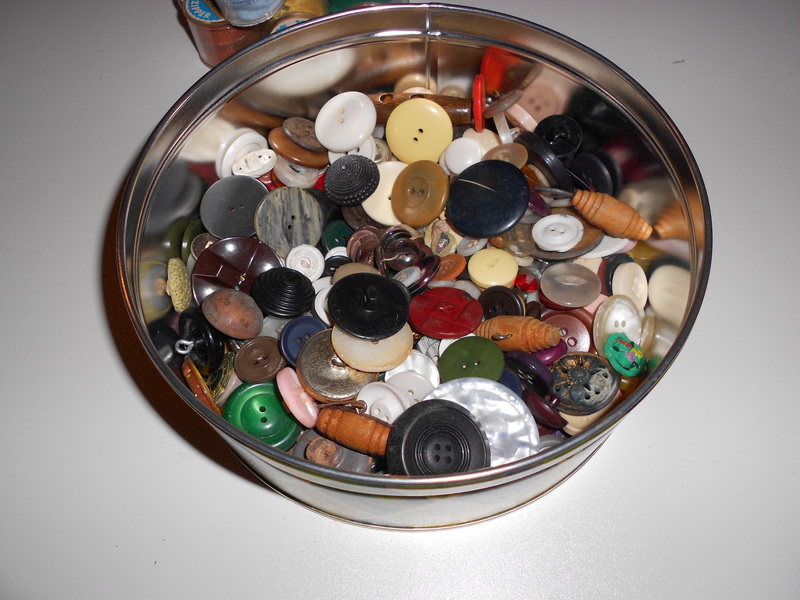 A tin full of old buttons and three glorious needle books, he found them all at a local goodwill store! 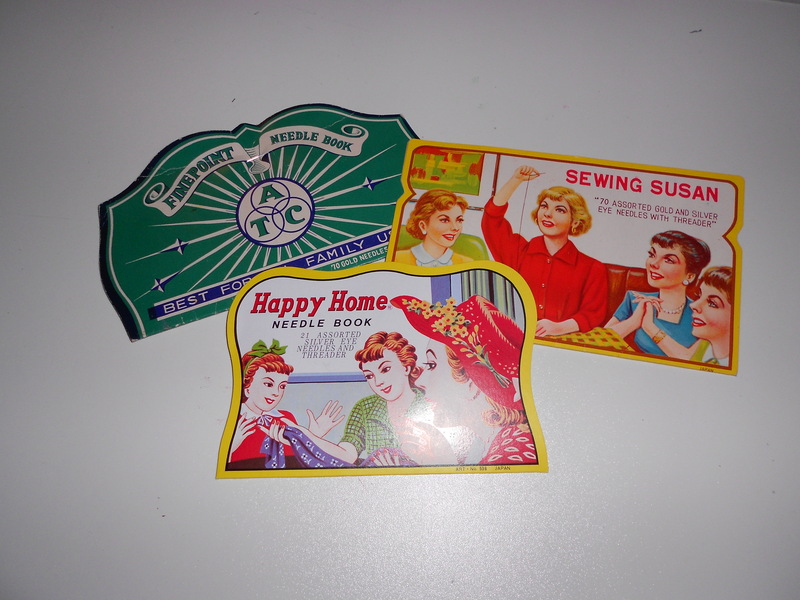 There is a great sew along starting today. It is all about Play Suits. 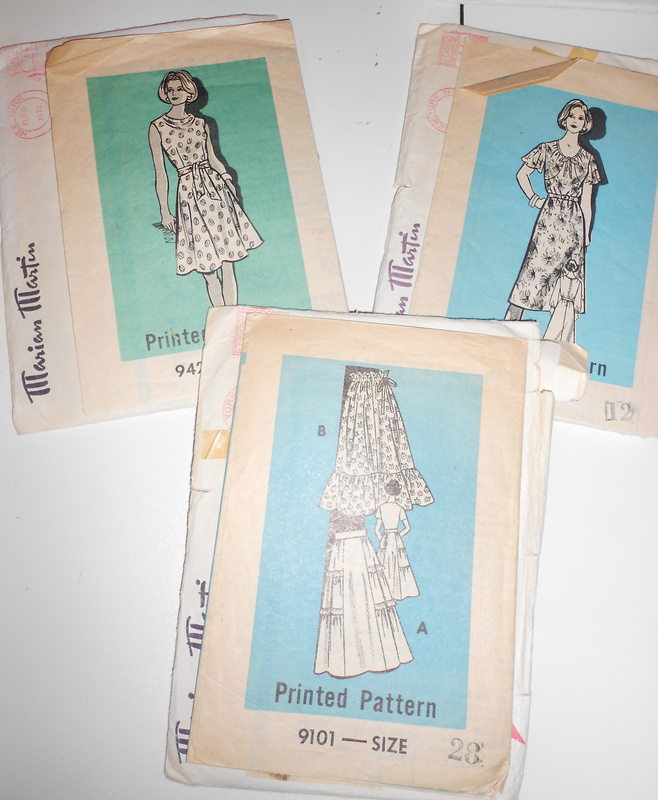 I did a little research and the earliest adult sewing pattern that I could find was in the late 1940’s. What fun outfits they are, some came with a blouse, shorts and a matching skirt, some were blouse, shorts and a coverup, some of them had full size bloomers, some shorts were like skirts themselves, some shorts are short and form fitting. 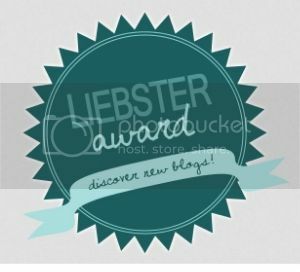 Head on over to ‘The Girl with the Star-Spangled Heart‘, read her inspirations she has posted through the month of May, grab a badge and let’s get started! 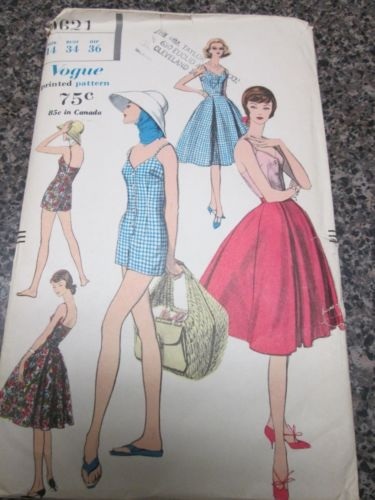 Stefanie, my youngest daughter, is the recipient of this sew-along outfit and I recently acquired a great vintage Vogue Pattern that I had planned on using. But she doesn’t like the fact that to made a visit to the ladies room is going to require the top and the bottom to come off. I had already promised her a vintage style swim top so we are combining it with two other patterns that I had in my stash to make a great playsuit. Now to get the muslins made up and then select the fabrics. 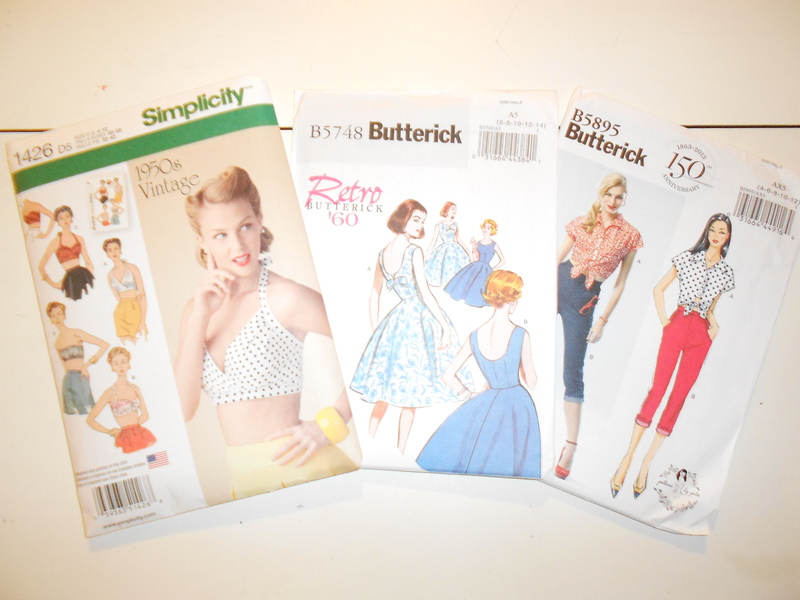 On to one last topic, I have managed to acquired a few of those handy dandy booklets and kits that swear you can draft a perfect pattern for you. 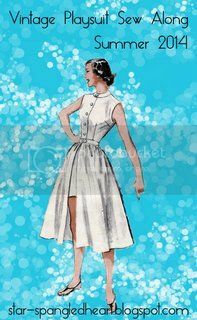 I have decided that I am going to give them each a trial run using the exact same dress form and measurements. I will makes notes, take plenty of pictures and try to recreate the same garment. 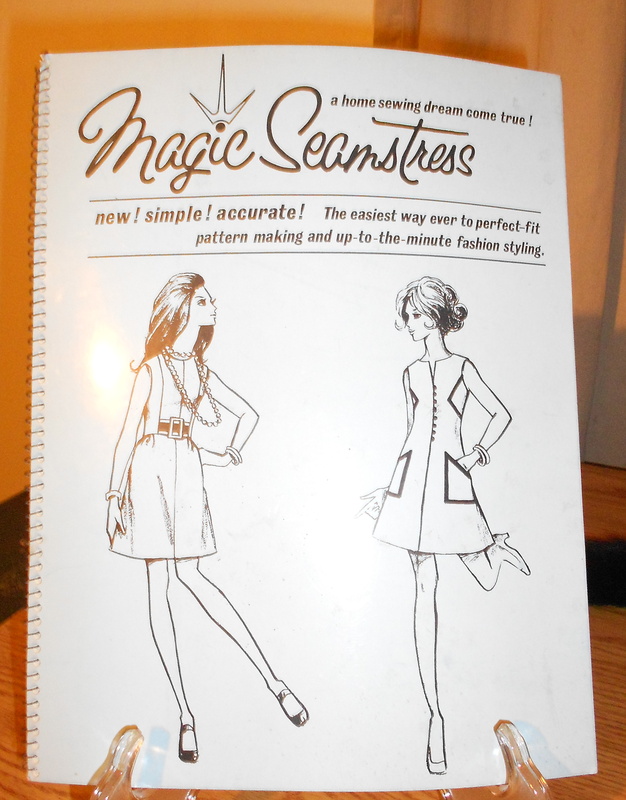 Stay tuned for my first choice, ‘Magic Seamstress’. 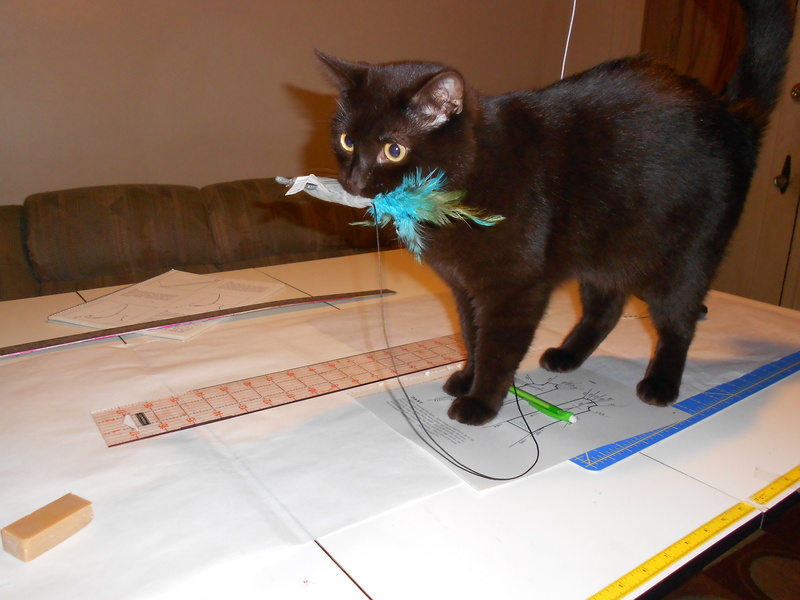 It is time to hope off, get ready for the new work week and give my kitty, Paulie the attention he is begging for. Who could resist that face?! I remember my mother having the cardboard packages for needles with the foil holders. I used to sit and take the needle in and out of the foil until the holes were too big to hold them anymore! 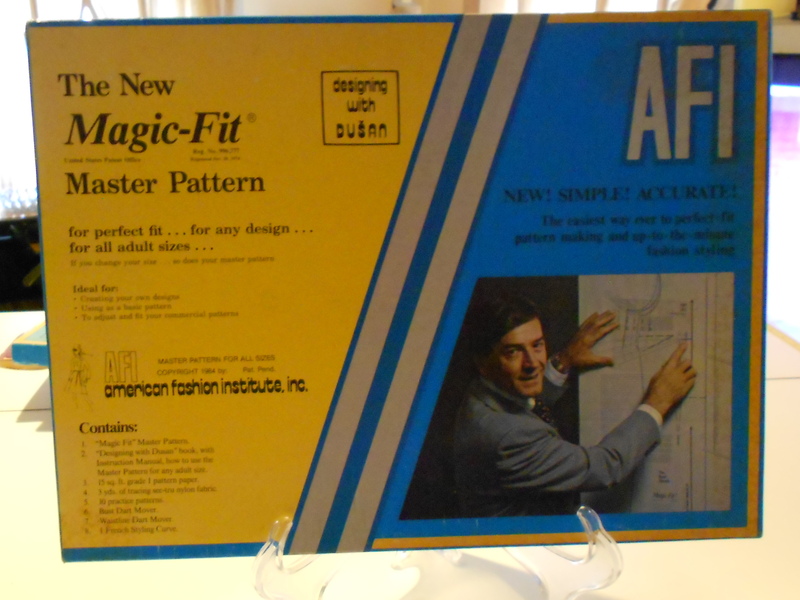 I have seen the Magic Fit on Ebay. Always wondered how it worked. 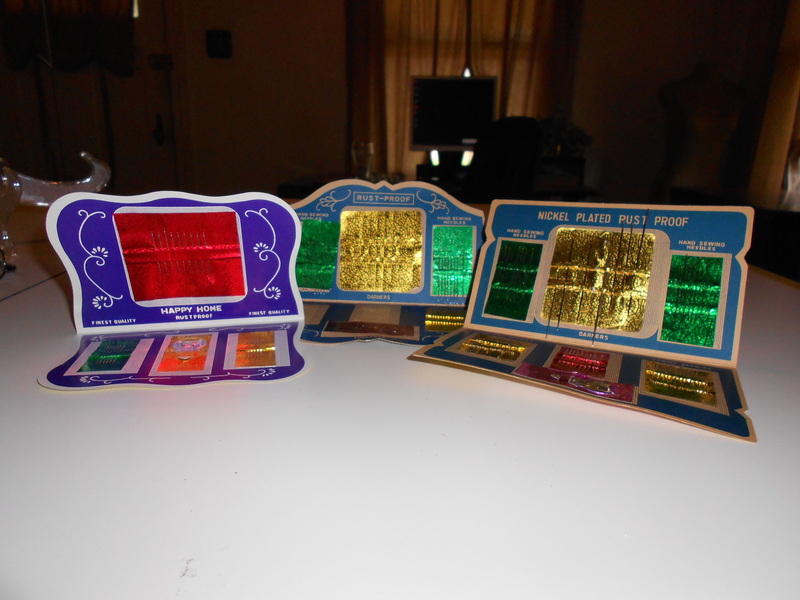 Oooh, what exciting thrift store finds! Especially the tin of buttons. There’s something wonderful about collections of buttons. My mother had a big jar of them, so did my grandmother. I’m trying to create my own but these things take time! I love that the buttons have come from old garments, that they’ve been rescued from clothes that people couldn’t carry on wearing. Good luck with the Play Suit sewalong. I’m looking forward to seeing what you make. Wow, looks like you got a great haul. I kept thinking, this must be the last picture, then scrolling down and there was another! I’m really looking forward to your reviews of the drafting books, too. And yeah, I feel your daughter’s pain re: a one-piece playsuit and visiting the bathroom; it’s basically the only thing I don’t like about mine! You are so lucky! Look at all the goodies! I love hoarding patterns. 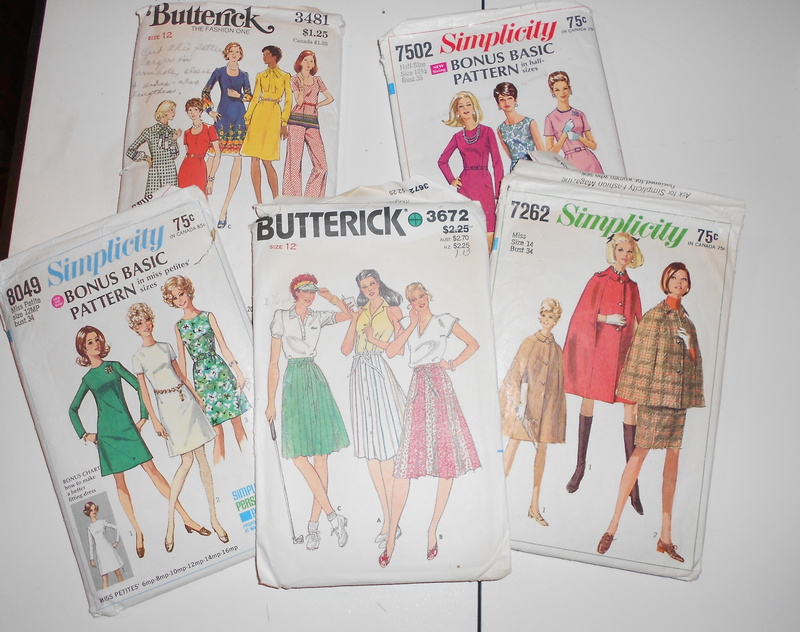 I was being good earlier this year and donated a bunch of patterns. I also…don’t hurt me…tossed some…into the…trash. They had been cut and altered. They also had some water damage, so I feel a little less guilty. I almost pulled them out of the trash a few times, but I didn’t think they would be useful. What fun to sort and find so many goodies! Wow! All those lovely finds!! 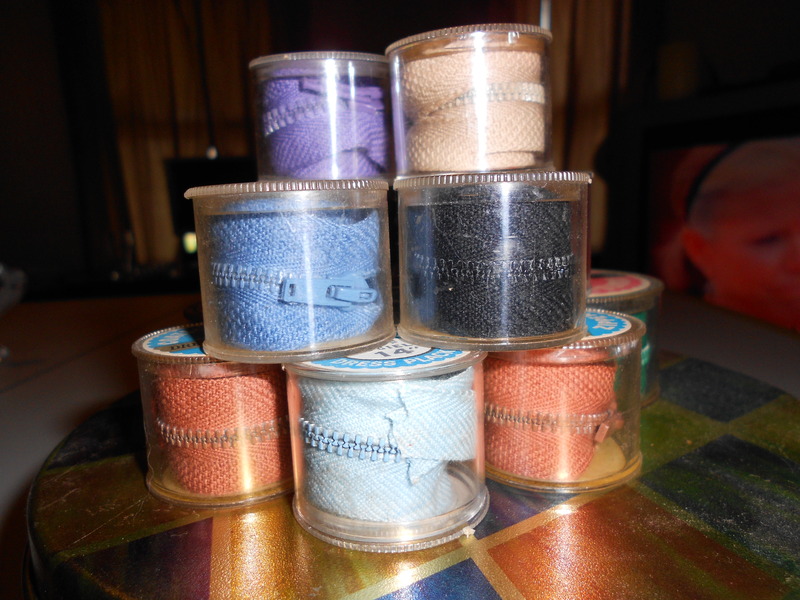 i can never find any sewing related items in thrift stores in Norway… I guess they all end up in some bin. It really is a shame. Totally jealous of your score!